Inspired by Mid-Century Modern and Danish Modern furniture styles of the 1950s and 1960s this is a collection of living room furniture typical of that style. 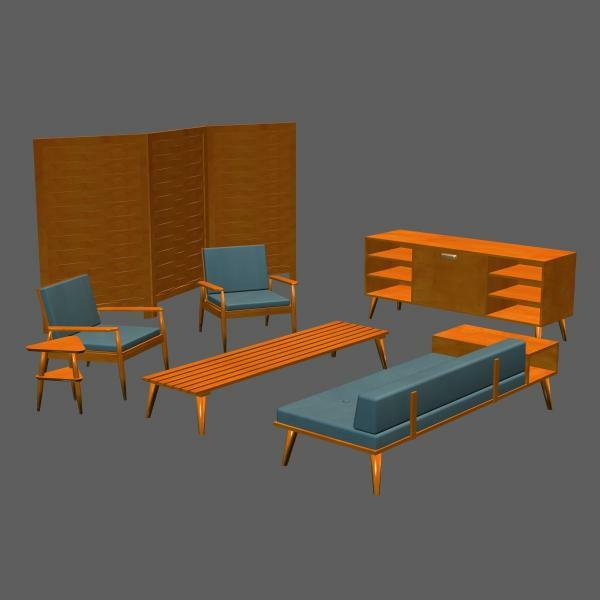 There are six (6) pieces included in the MCM Furniture Set. The texture files included are of fairly high resolution, to allow for close up scenes and detail. PC users and Poser users should (hopefully) have no difficulties with the .pp2 Poser files or the texture JPEG files, as far as I know, however they have not been tested on those platforms or software. Feel free to use this in any personal or commercial use. No credit is required, but is always appreciated. Some of the texture files used in the creation of this set come from CG textures. These images are free to use but may not be redistributed (in whole or part) by default. Please visit www.cgtextures.com for more information. So cool, thank you very much for sharing. Very nice and just what I needed for a set. Thx! Thank you for this lovely and useful set. I can so use this. You are most welcome! Thanks for downloading it. I hope it helps with your scenes!